UMPlayer is a new cross-platform SMPlayer fork. Since it uses Mplayer, it can play most video formats and comes with some very interesting features. For instance, it supports CSS skins so it's very easy to theme. I've updated UMPlayer to revision 143 in the WebUpd8 PPA - this update brings a feature many have been asking for in the comments: the time position in the video is now remembered (thanks to Steve for the tip!). Sublime Text 2 is a TextMate-like text editor currently in alpha which is now available for Linux too (as well as Windows and Mac OSX). Sublime Text 2 has also been updated to the latest rev but besides this, I've also incorporated Solarized dark and light color schemes with the Sublime Text 2 package. I've also announced this on ppa.webupd8.org but I felt this deserves a mention on WebUpd8 too. To get the new Solarized color schemes for Sublime Text 2 (Sublime Text 2 supports TextMate color schemes so these are TextMate color schemes) you may have to either purge the previous Sublime Text 2 (sudo apt-get purge sublime-text-2) and then reinstall or manually remove the config folder (~/.config/sublime-text-2 - you can backup some files if you've customized some settings and copy them back once you install the latest Sublime Text 2). Then, select Preferences > Color scheme > Solarized dark or light. Of course, if you want you can also manually install the Sublime Text 2 Solarized color schemes: download them from HERE, then place the files under "~/.config/sublime-text-2/Packages/Color Scheme - Default". 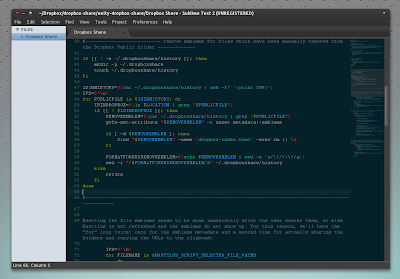 Note: Solarized for TextMate (which are used by Sublime Text 2) are currently work in progress.